Sometimes you gotta go a little simple when it comes to appetizers and snacking. 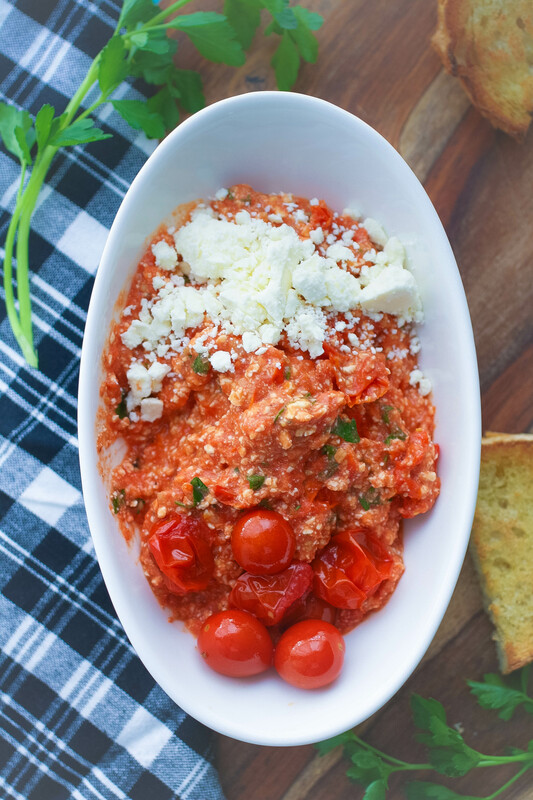 Nothing could be easier to make than this Roasted Tomato & Garlic and Feta Spread. Be prepared for a delicious addiction, too, because this spread tastes amazing! I love roasting tomatoes in the oven, and garlic, too! The tomatoes burst and are so juicy, and the garlic mellows out a bit when it’s roasted. But it still has that fabulous garlic flavor that goes perfectly with tomatoes. Tie that all together with feta cheese and a bit of parsley, and you’ve got a simple, savory spread that is perfect as an appetizer or to enjoy as part of a light meal. If you love tomatoes, try another of my dishes like Sautéed Peppers, Tomatoes & Zucchini. It’s perfect for a side dish. Another recipe that includes roasted cherry tomatoes is my Kale Pesto Pasta with Roasted Tomatoes and White Beans. It’s so colorful and hearty! I recently went to a really cool event where I picked up the tomatoes for this recipe. Produce On Wheels Without Waste (P.O.W.W.O.W.) is a program of Borderlands Produce Rescue in Nogales, Arizona, and hosted in conjunction with other local organizations, like Arizona State University. Borderlands rescues excess produce from the warehouses of distributors that are unable to market it, and sets up neighborhood markets across the state, where people can purchase about 60 pounds of fresh produce for $12. It’s an amazing program. Borderlands’ programs are available to nonprofit organizations, and to the community. They save produce from going to waste, and provide people access to fresh produce. How amazing! 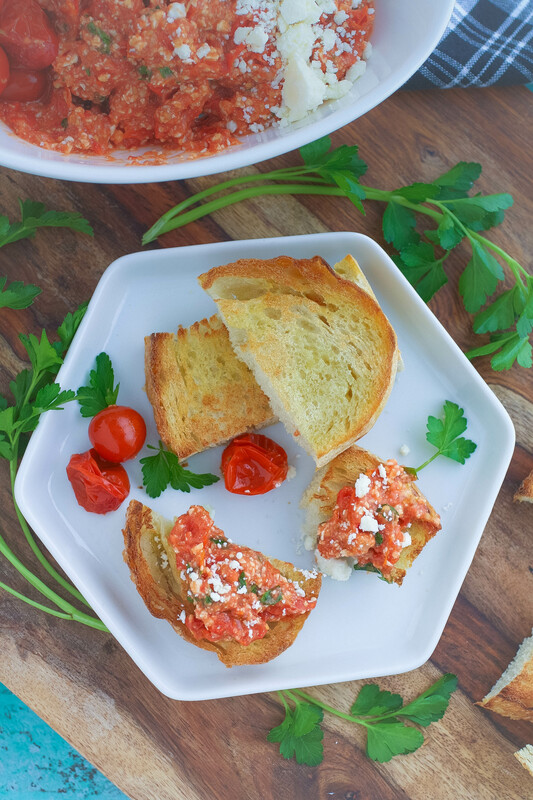 Roasted Tomato & Garlic and Feta Spread makes a fabulous appetizer! When I go to one of the events I never take home 60 pounds of produce, but I do make sure to pick up a few goodies to share with my neighbors. Watermelon was available this weekend, and my neighbors were thrilled that I shared. I encourage you to check to see if you have a similar program near where you live! 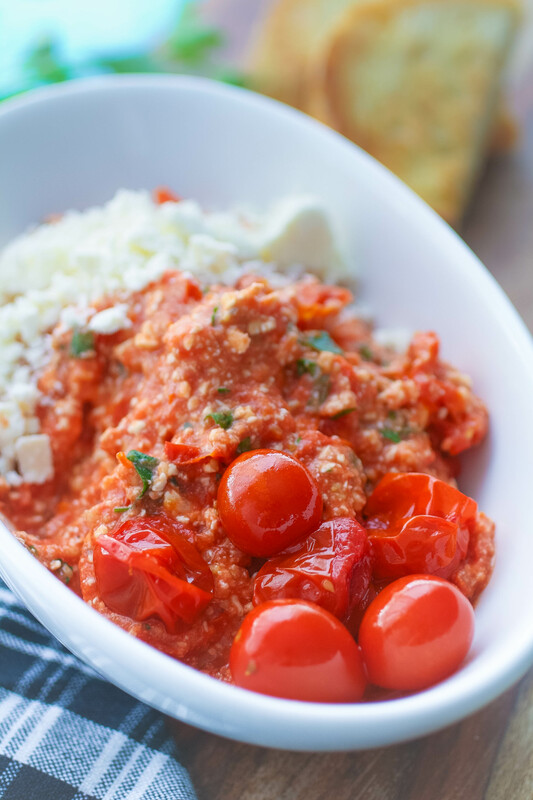 I know cherry tomatoes are available in markets year round, and Roasted Tomato & Garlic and Feta Spread would make a fabulous appetizer using your homegrown tomatoes when the season hits. Nogales, Arizona is on the border of Mexico, so much of the produce offered through the P.O.W.W.O.W. program might not be in season for some of you across the country. But definitely save this recipe. It’s a treat, for sure! 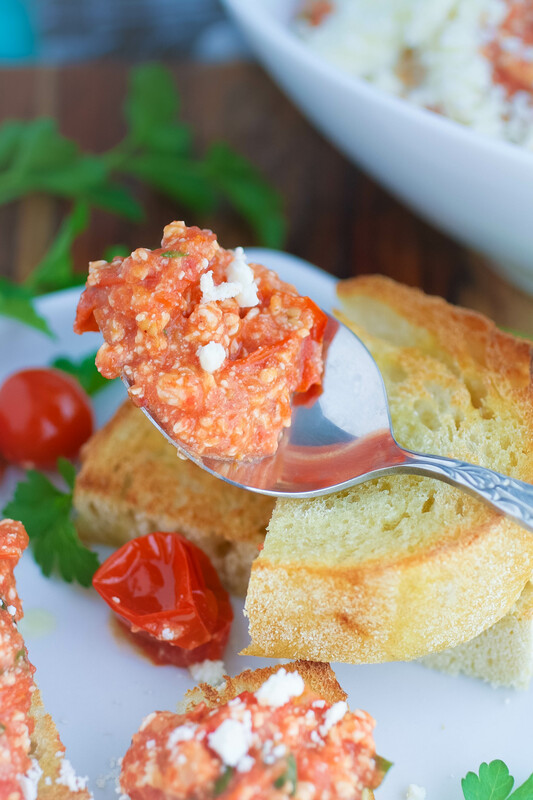 It only takes a short time to make Roasted Tomato & Garlic and Feta Spread that’s perfect for snacking. I could have eaten the entire bowl myself! Make a batch soon, and enjoy! Add the tomatoes and the garlic to separate, small pans and drizzle with the olive oil. Place in the oven. Keep an eye on the tomatoes, and when they burst after several minutes, remove from the oven. The garlic may take a few minutes longer to cook. When the paper on the garlic begins to turn color, remove and allow to cool. Remove the skin from the garlic. 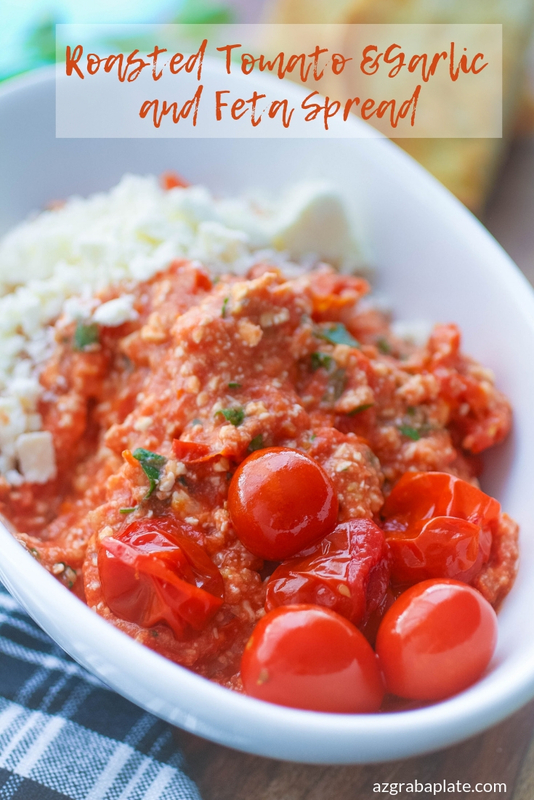 Transfer the tomatoes (reserve a few for garnish), garlic, feta, parsley, chili powder, salt, and black pepper to a food processor. Pulse until combined, with a few chunks remaining. Transfer to a bowl and serve with toasted bread or crackers. OMG this looks and sounds really delicious. I need to try it. Thanks, Heather! I hope you like it! Thanks, Paula! Let me know what you think! This sounds soo good but I don't like feta. Is there a cheese I could substitute? Well, maybe you could use blue cheese crumbles or ricotta cheese? I love roasted tomatoes! Can't wait to make this! Awesome! I'm glad to help add something to your "to-make" list! Thanks, Chrissie! Looks insanely delicious! I bet those flavors are amazing, need to try this! Thanks, Melanie! Oh, I just love this one! So fresh and flavor! This looks amazing! These flavors reminds me of summer! I love them so much! Yes, for sure, Catalina! 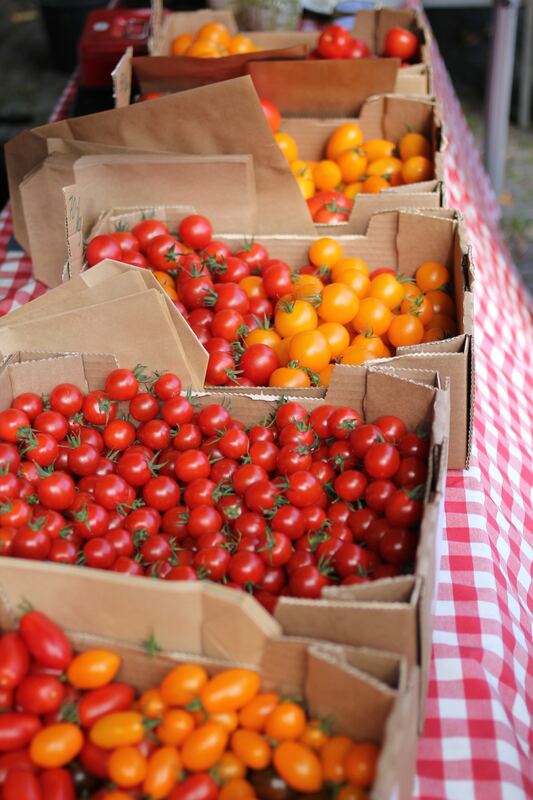 But anytime you can get your hands on those tomatoes, too! I'm drooling this is everything I love!